After marriage, women have to wear a mangal sutra. Why is that? Wearing the managal-sutra is a unique sign that a lady is married. Similar to the red powder she uses on her scalp (maang). It is unique because mangal-sutras are different in looks. It would be very difficult to find two mangal-sutras exactly the same. It was first seen in history with God Shiva and Goddess Parvati. It was a symbol of their holy and divine love. It was followed from then on and adopted a general rule. It is also one of the first gifts a man gives to his better half. It is generally made of Gold, its expensive. It symbolizes prosperity and happiness that a woman brings in the family she goes in. It is constructed to channel positive energy into the female's mind. See Nihil's answer for more info on that. The Mangalsutra is a symbolic representation of the divine deities which is Lord Shiva and Goddess Parvati. 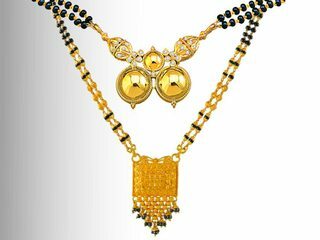 As per scripture of the Mangalsutra, the gold part represents Parvati and the black beads which holds the gold represents Lord Shiva. Gold is a symbol of prosperity and well-being. Hence, it is believed that if a woman wears the Mangalsutra, she brings happiness and prosperity in the family. According to scriptures, the Mangalsutra attracts a lot of positive and divine energy. In a Mangalsutra the two golden cups are hollow from one side and is raised on the other side. The Mangalsutra is worn with the hollow side facing the body so that the positive energies are attracted towards the void of the cups. This helps to keep the body and mind healthy. By wearing the Mangalsutra, the woman gains energy and power. It connects the body to the divine Shakti which resides in the body in the form of an element, fire. This gives the woman the energy to take care of the entire family and well-being of each member. As per the popular belief, wearing Mangalsutra is women's way to announce their married status. But if you are searching science behind this tradition, I would say that there certainly is science behind it. This ornament, which is so much adored by Indian women, is primarily made of gold or turmeric - both have medicinal values. Turmeric is known to control blood pressure and has antiseptic element. It is popularly believed that in India, women normally don't have cardiac issues (need reality check). Moreover, turmeric strengthens our immune system. Gold is eulogized by our Ayurvedic practitioners, who claim that this yellow metal helps us improve heart function; gold also keeps women's breast healthy and this consequently helps women produce good quality milk. I hope this information on science behind Hindu tradition helps you understand Hindu rites and rituals. Disclosure: I am the author of the linked article. Not the answer you're looking for? Browse other questions tagged belief marriage . Do a couple need to purify themselves after copulation?